Press Release (ePRNews.com) - FORT WORTH, Texas - Mar 15, 2018 - Steamatic Inc., an international leader in restoration and cleaning services, is excited to announce the re-sale of a franchise in Hutchinson, Kansas. The location, Steamatic of Central Kansas, will service the Hutchinson, Great Bend, McPherson, Salina and surrounding small towns. 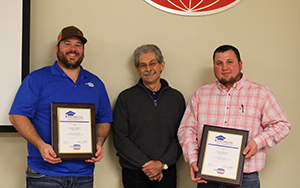 Adam and James recently attended a two-week Steamatic University training course at the corporate offices in Fort Worth, Texas, and have now returned to the Central Kansas location. It turns out that we were very lucky as we realized at training and the few weeks following the amount of support that Steamatic provided was immeasurable. “Steamatic is happy to welcome Adam and James to the Central Kansas market. The acquisition of an existing location is a sign of continued growth for the Steamatic network. Adam and his team have hit the ground running and I know that his customers will be completely satisfied with his work,” said Stefan Figley, president of Steamatic Inc.
Steamatic offers restoration and cleaning services in franchise territories throughout the United States and worldwide. Steamatic’s highly trained and certified technicians work with insurance agents and adjusters as well as residential and commercial clients to offer restoration services, including fire and smoke restoration, water mitigation, mold remediation and contents recovery. Commercial and residential cleaning services include carpet and area rug cleaning, hard surface cleaning, air duct cleaning, and furniture and drapery cleaning. Steamatic is celebrating 50 years of franchising and is recognized as a top franchise network. For more information on Steamatic, including franchise opportunities, please contact Kimmie Hack at 817-332-1575 or khack@steamatic.com.